Not only do you get the chance to take your pick of the whole gamut of fishing experiences you also get to fish surrounded by outstanding scenery. The Talyllyn & Cregennan lakes are picture-perfect glacial lakes fed from the slopes of Cadair Idris where you can fish against the backdrop of dramatically sweeping mountain slopes. Llyn Tegid, in Bala, is Wales’ largest natural lake and rests between the peaks of Aran Benllyn, Arenig Fawr and the mountains of Berwyn. Truely stunning. If it is river fishing that you are after, then the excellant Dyfi, Dysynni, Mawddach and Wnion rivers offer-up wild brown trout, salmon and sea trout (in late summer). All deliver double-digit fish regularly and are easily accessible. 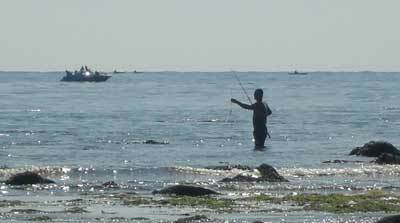 However, it would be a shame to come to Tywyn without trying out a spot of shore fishing. Working from the south to the north we have the Dyfi estuary, Trefeddian, and Dysinni estuary at Tonfanau. The Dyfi estuary can be reached from Aberdyfi and supports flounders and eels. It is also an important holding area for sea trout and salmon waiting for the river run. The Trefeddeian is a golden ribbon of sand, backed by dunes, that links Aberdyfi and Tywyn. 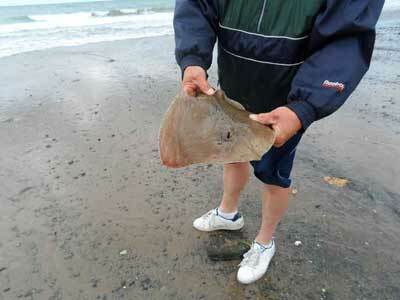 This stretch is good for bass, turbot, plaice, eels, mackerel, whiting, dab, dogfish, thornbacks, sole and flounder, depending on the time of year. Get yourself to Tywyn prom, face the sea, turn left, and keep walking until you get to the beach. Our third venue is Tonfanau where the Dysinni flows out into Cardigan Bay near the Sarn Y Bwch Causeway – a boulder bank. This is a popular spinning spot for bass on summer evenings but also supports flounder, dogfish, bass, mullet, turbot, small-eyed ray, pollack, lesser weever, grey gurnard, mackerel, whiting, poor-cod, pouting, codling, rockling and dab – again depending on the time of year. Keep an eye-out for dolphins and porpoises whilst you fish as they are attracted to the river current. The North Beach is clean with wooden and stone breakwaters. The beach itself shelves steeply to deep water (not very deep!) and attracts both reef- and sand-loving species. A good surf sustains the normal suspects. Spring: bass, mullet, turbot Summer: pollack, grey gunard, mackerel, lesser weever, small-eyed ray. Autumn/Winter: pouting, rockling, whiting, dab All year round: dog fish, flounder. Best fishing is to be had following a storm. Spotted this chap fishing the north beach. He had only just put his line in when he pulled out this adolescent ray. Walking south you will reach a stream crossing the beach which is a popular spot. Further south is the Dyfi Estuary which is equally popular. The Welsh record for turbot was set here with a fish of 10lb 4oz although local netting has reduced stocks. Spring: bass, turbot, plaice, thornbacks, eels. Autumn/Winter: whiting, dab, dogfish, thornbacks, eel, sole & monkfish (rare). All year round: dog fish, flounder. Wales, and Snowdonia in particular, offers simply the best fly fishing the UK has to offer and the rivers around Tywyn do not disappoint producing the largest fish and largest catches. Our rivers include the Dyfi, Dysynni, Mawddach and Wnion. All are easily accessible and surrender sizeable fish regularly. The scenery is spectacular and the rivers crystal clear and unpolluted. Otters are common as well as kingfishers, dippers and wagtails. The Dyfi is fed from the lake Creiglyn Dyfi and flows south to Dinas Mawddwy and then south-west past Machynlleth before eventually reaching Cardigan Bay at Aberdyfi. Species: brown trout, sea trout and salmon. Permits: The New Dyfi Fishery Association issues permits for much of Dyfi with day tickets available . Contact Mr I.C.Rees on 01654 702721 (open on Mondays and Fridays between 10 and 12 noon) who will be able help with exact fishing locations. Alternatively, permits are also available at Reads Garage and Filling Station, Machynlleth and Cemmaes Road Post Office in Cemmaes Road. A ¾ mile stretch of the river is controlled by the Buckley Pines Hotel (SatNav SY20 9LP). Telephone Mr D Wilson on 01650 531261. The Campaign For The Protection Of Welsh Fisheries have a fishing summary for Dyfi. The River Dysynni rises on the slopes of Calder Idris and feeds Talyllyn before exiting on its western edge and continuing through Peniarth for 10 miles before entering Cardigan Bay just north of Tywyn. Species: sea trout & salmon (August, September & October), brown trout (April onwards). However, it doesn’t have to be all pay-on-the day. You can fish for free in the Broad Waters – a stretch of the river just inland of the river mouth – as well as trying a spot of fly or spinning for bass in the estuary. The Campaign For The Protection Of Welsh Fisheries have a fishing summary for Dysynni. The Mawddach is fed from the slopes of Rhobell Fawr and flows through Ganllwyd, Llanelltyd and Penmaenpool on its way to its estuary at Barmouth. The top section, above Ganllwyd Village, is rocky with numerous gorges, waterfalls and holding pools. The lower section, from Junction Pool down to High Bank, is tidal. The Wnion is Mawddach’s largest tributary and is a good sea trout river. Permits: Dolgellau Angling Association 01341 422706. The Campaign For The Protection Of Welsh Fisheries have a fishing summary for Mawddach & Wnion. 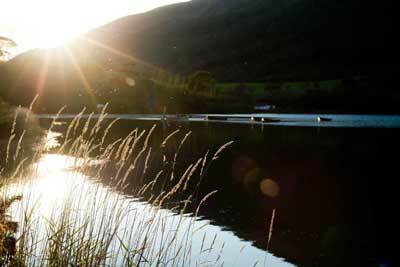 Talyllyn lake and Cregennan are within easy travelling distance of Tywyn. Talyllyn is a 220 acre crystal clear glacial lake fed from Dysynni which springs from the slopes of Cader Idris in the Snowdonia National Park. Permits are available from Tynycornel Hotel 01654 782284. Boats and float tubes can be hired. The lake has an average depth of 8ft and delivers excellent brown trout fishing which is supplemented by salmon and sea trout in the summer. Cregennan Lakes are owned by the National Trust and lie 5-miles west of Dolgellau and 1½ miles east of Arthog (SatNav LL39 1LJ). The lakes are fed from the northern slopes of Cader ldris and deliver brown trout, rainbow trout and blue trout. Permits are available from Cregennan Lakes who can be contacted on 01341 250426 or 0785 4139766. There are several charter boats based in nearby Aberdyfi that will take you out further for a whole range of deep sea fishing possibilities from bream to shark. Need somewhere to park the family whilst you are busy? 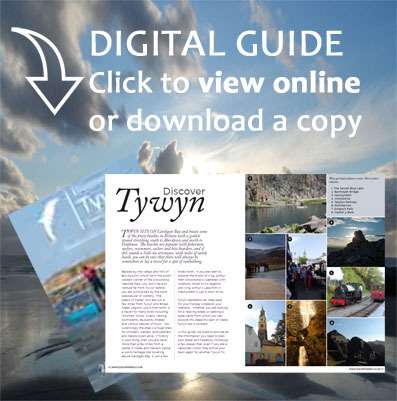 Try our Tywyn & Snowdonia Things to Do Guide for non-fishing related stuff to do. This entry was posted in Activities and Attractions and tagged Fishing on 3 June, 2018 by Paula.